Alert! Cats have absolutely taken over. They’re everywhere. They’ve virtually conquered the Internet and can be seen roaming the streets and filling people’s homes at dangerously increasing rates. Why, we just met a kindly lady the other day whose house had been invaded by sixteen cats! And two were pregnant! This is no longer a world where the debate of dog versus cats can even take place. The cats will hack the Internet dialogue and the polls will be overrun. There are very few options that we have left. When one invasive species comes to populate and dominate a region, all that can be done is to bring in an even greater species that can try to quell the population down. Unfortunately, cats just don’t seem to care! Their strong independence leaves them with the power to simply shrug and paw away with little more than a hiss. So, the Ministry of Educated Opulent Wunderkind has called for the Tigress Strikeforce. If nothing else, the cats will listen to a bigger cat! 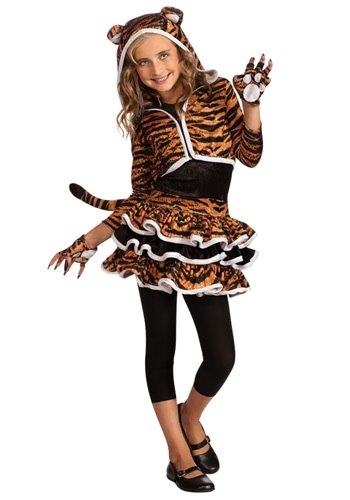 I got this costume and my daughter loved it. I would totally recommend this. Great costume. High quality. Came very fast. Thank you! !